Eregion shouldn’t be there. 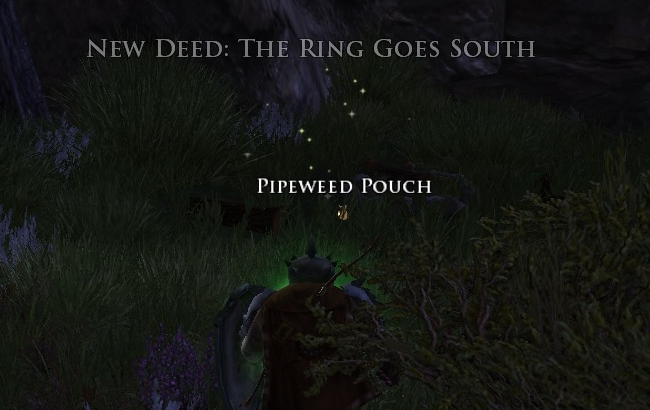 It shouldn’t be in the LOTRO Legendary server yet. I shouldn’t be able to access it. As a zone, it was not part of the original launch content, or even a post-launch addition like Evendim and Forochel. 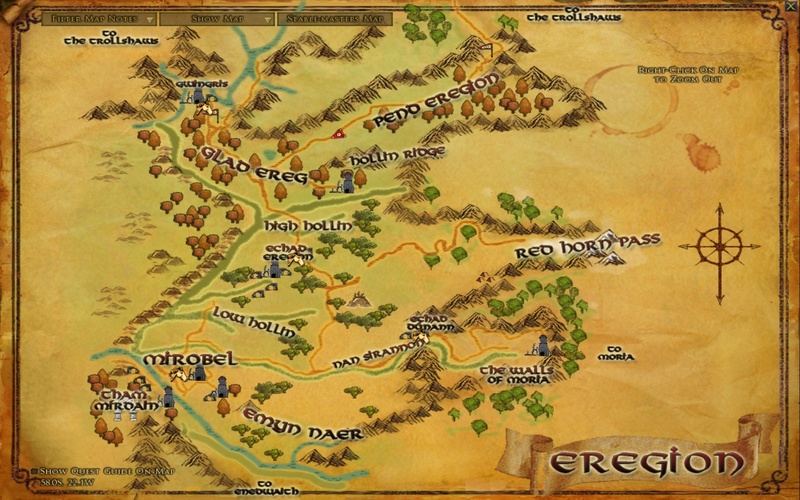 Eregion came in with the Mines of Moria expansion in early 2009. It is the starter zone for Moria, the warm up that sets your location relative to the fellowship of the ring as well as the place where you pick up your legendary weapon so you can start that endless grind. Also, as you progress through the zone, you start getting quests where the reward is experience for that millstone about your neck, your legendary weapon. Only you can’t get one of those yet, so doing those quests are something of a waste. Anyway, if you are keeping a list of all the ways that the LOTRO Legendary has included things that weren’t there at launch… and that must be a very long list by this point… you can add Eregion to it. On the flip side, it would be hard to keep Eregion out. Since SSG was determined to keep the effort as low as possible for this server, Eregion pretty much had to stay in because you can walk there if you so desire. So, short of having a different map for the server… and I don’t think the patcher is up to even that level of complication, given how it seems to need to take its shoes off to count to twenty some days… we were just going to have to deal with Eregion being part of the first chapter of the server. Eregion is also a bridge zone, a link between what happened in the original Shadows of Angmar content and what was to come in Mines of Moria. It is where you prepare for your new life under ground. It is also where the hand-off between Volume I and Volume II occurs, so I suppose it isn’t a stretch to argue it ought to be there. You need to go there in order to finish up Volume I in any case. And so it was that I launched into Book XIV of the epic quest line. This book doesn’t center around a single zone, but rather sends you out again on a grand tour of various locations in Eriador. We have the two halves of the ring Narchuil, so now we have to find out what happens next, all of which starts with Laerdan. 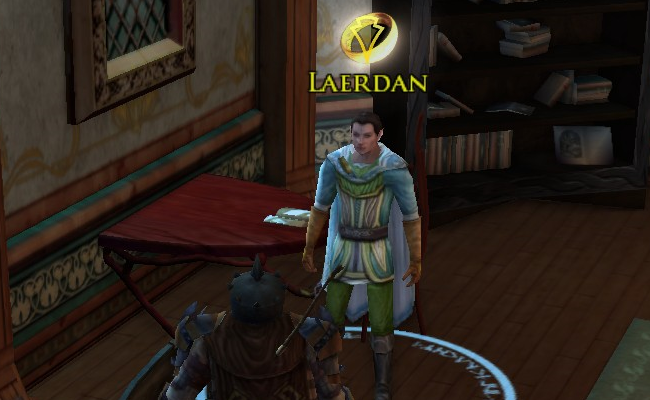 So, what’s it going to be Laerdan? 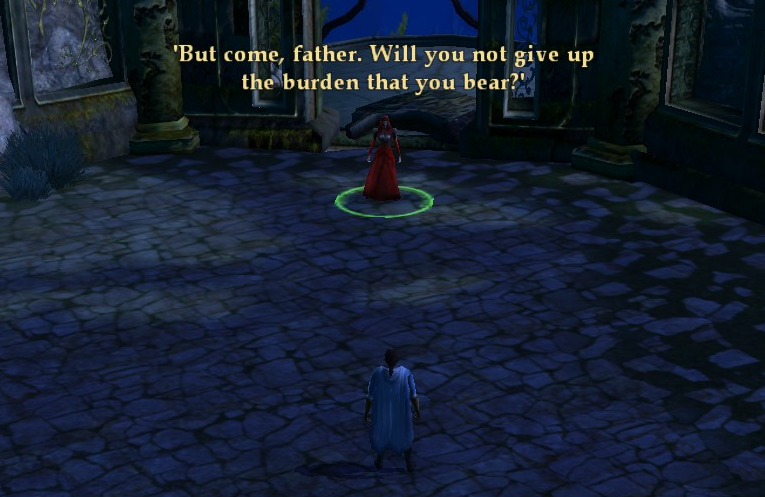 There is much running about across the landscape and a series of instances that tell what happened between Laerdan and his daughter Narmeleth, possessed by Amarthiel (and who can appear as here… or Sara Oakheart… as needs require) that I am sure would take years of therapy for either of them to work through all of what happened. The whole thing is drawn out too far and makes you play as other characters with different abilities from time to time, something that always gets on my nerves when over-used. You even have to run around and wake up sleeping orcs with a good, swift kick at one point, which might remind you of early quests in Durotar. Eventually though it is off to Eregion, to the ring forges found there where the one ring… edit: nope, not the one ring… its companions (the three, seven, and nine), and an unknown number of lesser rings (including Narchuil) were made. That all comes together at the instance at Tham Mirdain, down near Mirobel, in the southwest corner of the zone. As before, this is a fellowship sized instance which, if you attempt it solo, you get a buff that makes you powerful enough to master it. The instance is straightforward enough. If you take on each group around an area it will save you some bother as they’ll all come to help if you go straight for the obvious main NPC there abouts. In the end I made it through and found myself facing Amarthiel. But Narchuil had already been reforged and she now wore it. 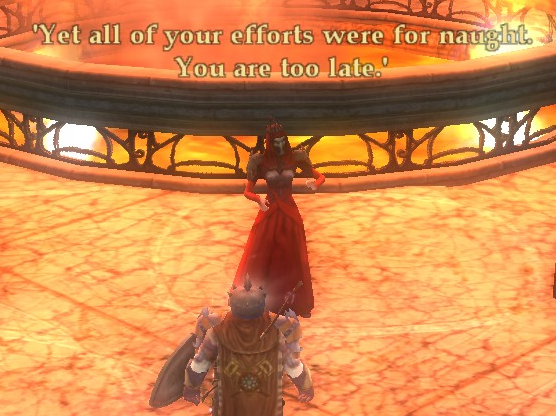 She kindly offers to let me be the first to die to her new toy when Mordrambor, who has been running around after the ring himself shows up. He also seems pretty confident that he holds the upper hand despite Amarthiel having the ring. He has a backer, some power in his corner now, some heavy ammunition in his camp, but he isn’t saying who quite yet. And then we find out as Mordirith, who I thought Golodir and I had defeated back at the end of Volume I, Book VIII in Carn Dum deep in Angmar. Reports of his death, however, were greatly exaggerated. 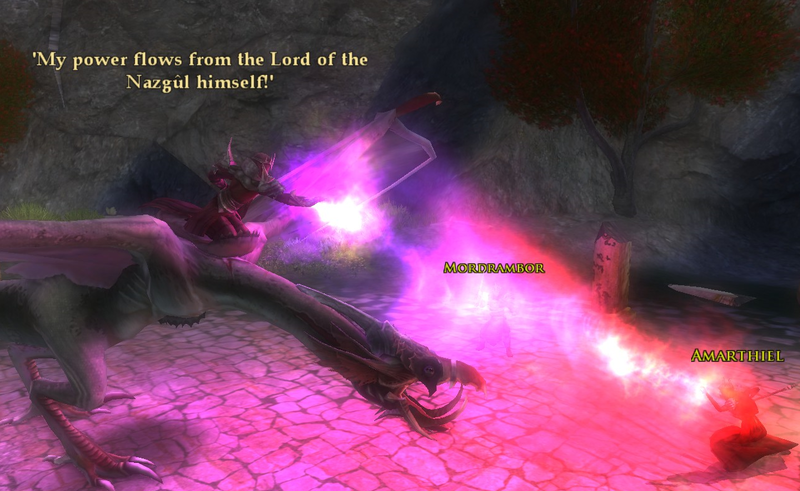 The trio re-united in Eregion… Mord has a dragon mount now! To cut to the basics, this was all a ruse to test Amarthiel. 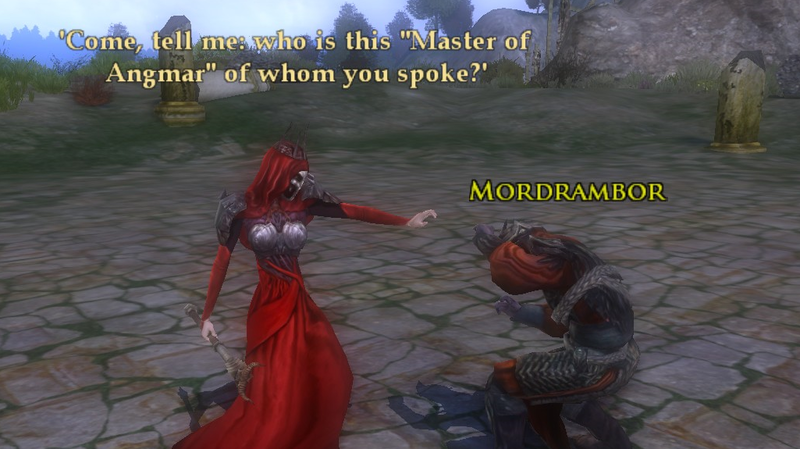 She failed, Mordrambor is awarded the ring by Mordirith. Amarthiel is rightly pissed and tries to defy Mordirith, which works out about as expected. It was kind of like the duel between Harry Potter and Voldemort… only they are both evil and you’re probably screwed no matter who wins. The power of the Nazgul prevails and Amarthiel lays broken and sobbing on the ground as Mordrambor takes the ring from her. 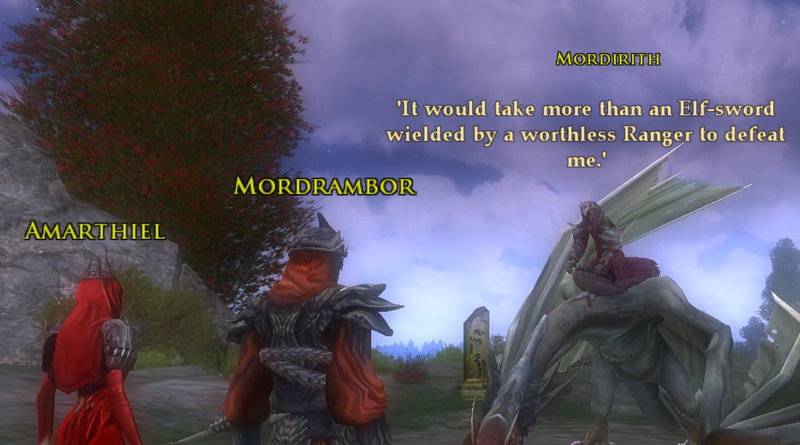 And then Laerdan shows up, because this is the grand finale I guess, and promptly gets himself smote by Mordrambor because he called Mordirith by his middle-school nickname or something. And so the scene ends. Mordirith flies off on his dragon. Mordrambor disappears… I guess the ring gave him that power, as previously he had to exit scenes on his own two legs. Laerdan is… well… not dead. Elves don’t die, being tied to the fate of Arda for all time, so he could come back. But his current body was laying there lifeless. And Amarthiel is just sprawled on the ground, her plans undone. The narrator says you capture her, but that is played off screen. And that was it for Book XIV. Just one more book to go to finish out Volume I of the epic quest line. This entry was posted in entertainment, Lord of the Rings Online and tagged Amarthiel, Eregion, LOTRO Legendary, Mines of Moria, Mordirith, Narchuil on January 29, 2019 by Wilhelm Arcturus.